This is the first post in a series looking at the mile-by-mile history that took place along the course of the 7.1 mile Litchfield Hills Road Race. The 40th running of the LHRR takes place on June 12th. Look for a new post each week leading up to race day. It is a race that begins, metaphorically and literally, with a bang. While runners enjoy the quick start to the race provided by the downhill slope of West Street, it is the firing of a reproduction of an 1841 six-pound cannon by the First Litchfield Artillery that sends the 1,500 runners on their way. While the First Litchfield Artillery registered itself with the Secretary of the State in 1964, they are the heirs to a long tradition of militia organizations in Litchfield. As late as 1851, all able-bodied men between the ages of 18 and 45 were required to serve in the militia. A modern reconstruction of a palisade. The militia played an essential role in the town’s earliest days. From 1720 to 1730, five palisades – fences or walls made from wooden stakes that formed a secure enclosure – offered defense for the town. These were located north, south, and east of the town, with a fourth in South Farms, the area of Litchfield that is now the town of Morris. The fifth palisade was at the site of the current courthouse, which runners pass immediately after the cannon fires. Legend holds that the widow Mercy Allen, one of the earliest settlers of town and the grandmother of Ethan Allen, helped build one of the palisades and manned it during threats of attack from Native Americans. Regardless of the veracity of the accounts of Mercy’s participation, members of the militia manned the palisades while townspeople worked in the fields and attended Sunday church services. The defenses weren’t always successful. In May of 1722, Jacob Griswold was working alone in a field one mile west of the current court house when two Native Americans tackled him and carried him off to what is now North Canaan. Griswold, however, managed to steal a rifle from his captors while they slept, and made his way back to Litchfield. A mile or so north of town, he fired off the weapon, which warned the defenders in the nearby palisade of his plight. They helped ensure his safe return to town. Oliver Wolcott, Jr. 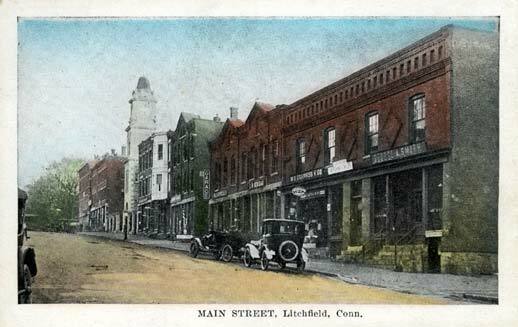 Courtesy of Litchfield Historical Society. Fifty-five years later, the presence of the British army in Danbury set off another alarm in Litchfield. The town’s militia was called out and sent south to drive out the king’s troops. Among those who participated was Oliver Wolcott, Jr., who was home from Yale. (Runners pass his home in the seventh mile.) His mother, Laura, sent him off with a blanket, a knapsack full of food, and an admonition to “conduct like a good soldier.” The Litchfield men encountered the British in a skirmish in Wilton, and helped force them to retreat. The modern-day artillery company is comprised of veterans who are United States citizens. Additionally, members are expected to be knowledgeable about Connecticut history. They work to preserve the traditions of horse-drawn artillery, participate in Memorial Day, Independence Day, and Veterans Day observances, participate in ceremonies at the request of the governor or the Connecticut Historical Commission, and help the governor uphold the laws. Despite these lofty objectives, the artillery company is probably best known for sending nearly 1,500 runners through the streets of Litchfield. This entry was posted in History, Uncategorized and tagged Litchfield, litchfield artillery, Litchfield Green, Litchfield Hills Road Race, militia by pvermily. Bookmark the permalink.